James Sylvester was an English mathematician and lawyer who, in 1850, first used the term "matrix" in mathematics and gave it its present meaning of a rectangular array of numbers from which determinants may be formed. Together with Arthur Cayley, he founded the theory of invariants. Hot-headed and vociferous in opposition of anti-Semitism, Sylvester was thrown out of the University of London for threatening another student with a table-knife. Later he studied at Cambridge, emerging as Second Wrangler but without a degree (though in 1871 he earned an MA) because, as a Jew, he refused to accept the articles of the Church of England. 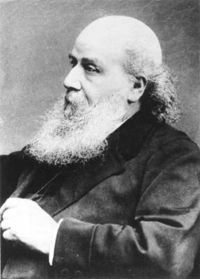 After a spell working as an actuary and a barrister, and also taking private pupils (one of whom was Florence Nightingale), he met Cayley, with whom he forged a life-long friendship and collaboration, and returned to mathematics. He became professor of mathematics at the Royal Military Academy at Woolwich (1855–70) and at the newly established Johns Hopkins University at Baltimore (1877–83), founding the American Journal of Mathematics, before accepting the Savilian chair at Oxford (1883–94). Remarkably, especially in the field of mathematics, Sylvester produced an extraordinary flood of ideas well into his old age. At 82, he worked out the theory of compound partitions. He also published on the roots of quintic equations and on number theory. His partnership with Cayley worked perfectly, since Cayley supplied the rigor which the brilliantly creative Sylvester lacked. Sylvester's problem of collinear points is a problem posed in 1893 by James Sylvester, who wrote: "Prove that it is not possible to arrange any finite number of real points so that a right line through every two of them shall pass through a third, unless they all lie in the same right line." No correct proof was forthcoming at the time, but the problem was revived by Paul Erdös in 1943 and correctly solved by T. Grünwald in 1944.